I read the posts about creating a suppression list and followed the instructions. First I created a new list called "Supression List" and imported a CSV file with 7275 records in it. However, only 5623 records were imported. Is this because 1652 emails were already in the lists under this brand? If so, then how do I mass unsubscribe those 1652 people? I was planning to use the Mass Unsubscribe comment from within my master list (rather than from within the Suppression List) but wanted to check first before I screw something up. Also, does that mean I can't import any subscribers into a list within a brand, if they are already in a different list within the same brand? I assumed a subscriber could belong to multiple lists within a brand. A subscriber can still be imported if he exist in other lists. 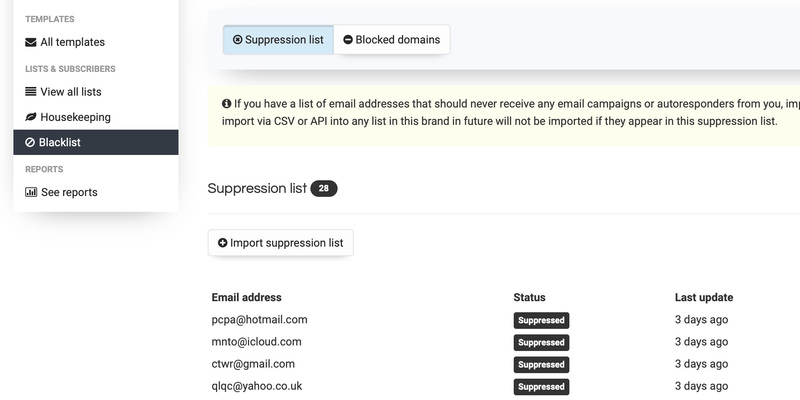 You don’t have to worry about the rest of the ‘1652’ emails not being imported as they are already suppressed, that’s why you can’t import them. Yes, thanks. I did confirm that many of the 1652 were not imported because of duplicate or incorrect entries in the original CSV. The rest were probably already suppressed, as you indicated. Regarding my question about Mass Unsubscribe from within a particular list, as opposed to using a separate Supression List -- I take it that would unsubscribe those people ONLY from that one list, whereas doing it from a separate suppression list would remove them from all lists in the brand. Is that correct? I take it that would unsubscribe those people ONLY from that one list, whereas doing it from a separate suppression list would remove them from all lists in the brand. Is that correct?